For the fourth summer in a row, we here at the Dead Homer Society will be spending some time discussing twelve year old Simpsons episodes. This year we’re doing Season 11. Why Season 11? Because we’ve done Seasons 8, 9 and 10 already, and it’s time to take an unflinching look at the end of the show. Since Skype and podcasts didn’t exist in 1999, and we want to discuss these episodes the way the internet intended, we’re sticking with the UTF-8 world of chat rooms and instant messaging. This text has been edited for clarity and spelling (especially on “hantavirus”). Today’s episode is 1106, “Hello Gutter, Hello Fadder”. Yesterday was 1105, “E-I-E-I-(Annoyed Grunt)”. Charlie Sweatpants: This one is, if anything, worse overall than the Tomacco one. Mad Jon: As an episode whole, I think I agree. Charlie Sweatpants: Tomacco has a few good ideas and jokes if you feel like waiting through all the crap. This one, pretty much just crap. Mad Jon: I am not a TV writer, or a professional critic, but this episode wasn’t coherent at all. Dave: This is a thousand monkeys typing on a thousand typewriters and completely botching it. Mad Jon: The lows were not as low as the Tomacco one in my opinion, but it seemed like the whole thing was one solid low point. Dave: Yeah, what few highs were in Tomacco were nonexistent here. Charlie Sweatpants: What bugs me, and this is a general Season 11 complaint though it’s in evidence in spades here, is the way the show yo-yos back and forth between a kinda serious/obeying some rules mentality to completely weird/Halloween episode, sometimes within the same scene. Mad Jon: I don’t get the plot at all. Maggie wants attention from Homer, who won’t give it to her, then he wants to give her attention but she doesn’t want it, then he eats shark eggs and she pulls him out of the rip tide? Charlie Sweatpants: Homer’s worried about Burns firing him, okay, kinda normal there, but then Homer feels up Burns’ face, pulls out his teeth, and starts eating radioactive goo. Mad Jon: yeah, the face grab/reactor core beating/waste eating bloc was a tough one to swallow. Charlie Sweatpants: Right, it’s nominally about Homer and Maggie drifting apart, then he spends time with her, then she saves him. The events aren’t connected in the least. Got it. Are you sure you’re not a professional TV writer? Mad Jon: I know, can you believe it? Dave: Jon, quit your day job. Charlie Sweatpants: But this episode is full of things like that. Homer’s bowling a perfect game, but then his family shows up in the last two frames all the way from home. Homer’s sad, and then he’s instantly suicidal, and then he’s not again. There’s no connection to any of it. For example, Penn and Teller. Where the hell did that come from? Mad Jon: I dunno. Why are Disco Stu and Skinner’s Mom on the game show? A game show where the guest stars are Ron Howard, Homer, and Princess Kashmir. Charlie Sweatpants: That part didn’t make any sense either, like, is he supposed to be a local celebrity? And Ron Howard, I get why they had him back on because he’s very funny (and we all know that a crap narrator would’ve sunk Arrested Development), but he’s just pointless here. Mad Jon: Nothing against Ron Howard here. Just like Mel a few episodes back, he did as well as anyone could with the given situation. But why is he on a local Springfield game show? That’s all. Charlie Sweatpants: Well, this was right about the time when they just gave up on doing anything interesting with celebrities instead of just trading off their existing fame. Charlie Sweatpants: Penn and Teller are funny enough that they can have their little moment, but it has nothing to do with The Simpsons. It’s just them writing a sketch for Penn and Teller. Mad Jon: I also like the hantavirus joke. Charlie Sweatpants: What, for example, was the point of Homer and Maggie in the swimming pool? Setting up the ending? Why bother when it’s so transparently insane anyway. Why does Homer get electrocuted? Oh right, they wanted to make a weak Teletubbies joke. Mad Jon: Yeah, probably could have had the same effect without the pool scene. Charlie Sweatpants: Why does Homer choke on the 300 game balloon? Dave: So we can watch him choke. Charlie Sweatpants: What’s with that shtick laden scene where Lenny distracts Homer? There’s so many of these pointless scenes here, it’s amazing that they managed to be that consistently mediocre. Charlie Sweatpants: True enough. 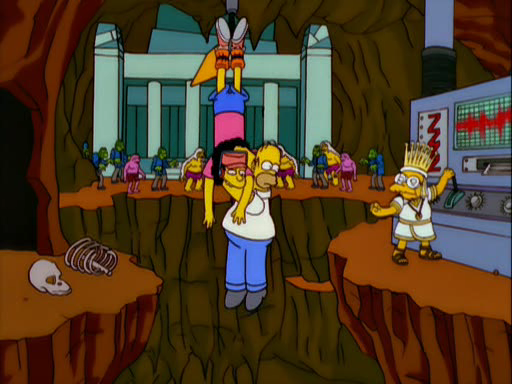 The mole people thing here is definitely a precursor to the Jockey Elves, but we’ll get to that soon enough. Charlie Sweatpants: Yeah, it’s coming, but really, is it any less fantastical that what happens here? Mad Jon: No, I guess not. It is just a different type of fantastical. Charlie Sweatpants: And in the meantime, we get to see Marge vanish for the whole episode here while Homer flails about with Maggie, Bart sit quietly with Nelson in his room, and Homer pops out of a manhole cover just in time to have Ron Howard drive by. Mad Jon: I almost forgot about Nelson. Charlie Sweatpants: They needed him for a second, so he appeared. Standard Zombie Simpsons. I really dislike this episode, and if we can just all agree to forget about it forever now, I’d be cool with that. Mad Jon: I got nothing. I don’t like either of these. Not at all. Charlie Sweatpants: But if there are any other lowlights you feel need discussing, we can do that. Dave: Nothing from me. Let’s never speak of these again.